Late today I encountered a frank new commenter at Belmont Club. It was on Wretchard's latest exploration of the AGW fraudulence. We should all be aware of who wants to pick the winners and losers. Civilization as we know it is confronted with serious issues. It just so happens some think they can determine the outcome. These are not ignorant people, and carbon is a vehicle to the solution in their eyes. The problem is that they equate survival as a species with a socialist (we all know where that ends) state. Climate change propanganda is the vehicle to get there, since stating the obvious issues would generate even more populist resistance. The myth that technology can solve everything is patently false. Bear, I’ve been battling with this concept a very long time. Few are willing to state it as you have. There is redundancy in your assertion “The myth that technology can solve everything is patently false.” It sounds like you want to believe your line so much that you had to call technological solutions both a myth and patently false. Dare you battle with me over it? Tragedy of the Climate "Scientists"
To qualify as science, a theory must come with all data intact Where data is excluded, it must come with an explanation. The object is for others to BE ABLE to test the theory; to let all comers try and prove it is wrong. Hiding or discarding data is not science. Since such behavior will get a freshman flunked out of Lab 101, it appears some PhDs have traded their hard earned names as part of the requirements to obtain their latest grants; traded their good names for a bowl of beans as it were. We know our politicians always hanker for reasons to tax us, so it appears these "scientists" are simply the paid tools of they who fund them. I have little doubt these are bright men who once sought a prominent position amongst noted scientists of the past. All the more tragic that the 'leading climatologists" (in their own view at least) now appear to be the equivalent of the "learned" charlatans who worked for the despots of darker eras. Now, it seems, they are on the fast track of being forgotten along with the fraud who attempted to foist the "missing link" known as Piltdown Man on a credulous world a century before. But don't worry, it's all "peer-reviewed." Here's what Phil Jones of the CRU and his colleague Michael Mann of Penn State mean by "peer review". When Climate Research published a paper dissenting from the Jones-Mann "consensus," Jones demanded that the journal "rid itself of this troublesome editor," and Mann advised that "we have to stop considering Climate Research as a legitimate peer-reviewed journal. Perhaps we should encourage our colleagues in the climate research community to no longer submit to, or cite papers." So much for Climate Research. When Geophysical Research Letters also showed signs of wandering off the "consensus" reservation, Dr. Tom Wigley ("one of the world's foremost experts on climate change") suggested they get the goods on its editor, Jim Saiers, and go to his bosses at the American Geophysical Union to "get him ousted." When another pair of troublesome dissenters emerge, Dr. Jones assured Dr. Mann, "I can't see either of these papers being in the next IPCC report. Kevin and I will keep them out somehow – even if we have to redefine what the peer-review literature is!" Which, in essence, is what they did. The more frantically they talked up "peer review" as the only legitimate basis for criticism, the more assiduously they turned the process into what James Lewis calls the Chicago machine politics of international science. The headline in the Wall Street Journal Europe is unimproveable: "How To Forge A Consensus." Pressuring publishers, firing editors, blacklisting scientists: That's "peer review," climate-style. The more their echo chamber shriveled, the more Mann and Jones insisted that they and only they represent the "peer-reviewed" "consensus." And gullible types like Ed Begley Jr. and Andrew Revkin of the New York Times fell for it hook, line and tree-ring. Dear readers, I'm sorry I don't have the flourish with words of a Mark Steyn, but I do have my extensive background in engineering to recognize a snow job when I see one. I know how the "peers" act when they know the facts favor them, and I also know how they act when they are trying desperately to sell something that does not work. They're hoping to be up and out of the company with all their gains long before the fit hits the shan. I'll try to find the energy to continue offering my insights. Seeing Steyn use some of the same metaphors and imagery as I do, however clumsy I am have been at it, I find reassuring that my writing is improving. If you have ever looked at my masthead (up there ^ at the top) you may have wondered what in Blaise Pascal's Provincial Letters was so remarkable. I'm about to tell you in simple terms. He made a clear distinction. Be wary about following the recommendations of famous men simply because there is similarity with what they said then and what is being discussed now. Follow instead the procedures that let them arrive at the substantive and universally acclaimed opinions that earned them their fame. This is an important distinction that every common man should bring to bear when powerful people try to invoke the words of famous men to aid them in their quest for power. It may well be, and sadly is true, that all the powerful men are doing is exploiting the names of the men who were once famous or courageous, but who have no more wisdom about the current issue at hand than do you. Indeed, their names may have been bought, or at least they were patronized and flattered into going along. In allowing their names to be used, they trustingly fell prey to the powerful men. We, to our advantage, have the benefit of not having been flattered into letting our guard down. For this reason alone I was not prepared to discredit accomplished men until the depth of their involvement with the scoundrels was better known. Cautious skepticism was good counsel. Now the degree of deception employed by many climate "scientists" stands revealed. No matter what job I do, good or bad, I am often never sure if anybody notices. But there is one sure exception. My cat notices and appreciates it every time I clean out and add more litter to her box. This story, published in the UK's Mail Online today, apparently has been under wraps for about three years, Lord knows why. It testifies to the strength of the human spirit, so I love passing it on to you. That would be true even without the bonus of it poking the death cultists in the eyes. Doctors were convinced that a man left totally paralysed by a 1983 car crash was in a vegetative state for 23 years. According to this news report, written by Allan Hall, once the doctors of then student Rom Houben misdiagnosed him, that remained his official condition. 2) that error, and the fact that Herr Houben was actually conscious the whole time, was not revealed until November 21, 2009. He had no way of letting experts, family or friends know he could hear every word they said. 'I screamed, but there was nothing to hear,' said Mr Houben, now 46. Doctors used a range of coma tests, recognised worldwide, before reluctantly concluding that his consciousness was 'extinct'. But three years ago, new hi-tech scans showed his brain was still functioning almost completely normally. My additional commentary follows below the break. I have been informed that the NBC direct embed of the featured video does not play in some foreign markets. So I am now providing the LiveLeak alternative in addition (found at Instapundit). (The following is the address to the original NBC version I had embedded here. Pray this is but the first of many extra dividends to fall out of the CRU hack revelations. Today's title asserts that S I N I S T E R Media did not come about without the distinct aid of sinister sponsors. Let's look at what supports it. Media is now what was once solely the province of newspapers. Newspapers were so much an essential element in our republic's functioning that our Founders were counting upon a free and independent journalism class to provide another check in their checks and balances scheme. So much so that they are the only profession mentioned in the Bill of Rights. Adding even more distinction to their importance, they were dubbed the "Fourth Estate" by the father of modern conservatism, Edmond Burke, without a trace of the irony hanging over his grave. So media is heir to the Fourth Estate. As such, it is given somewhat more of a blank check in gaining access to the halls of government to ask nettlesome questions of those in power. Why, with all the hoopla attendant to lobbyists in the halls of power, is there not even more hoopla over who influences the Fourth Estate and its editorial policies which affect what questions are asked of whom? Surely if it is a public concern over whether or not the money of corporations and other entities can influence government officials, whose sole source of money is not those entities, then surely similar concerns ought be raised of the money which principally sponsors the Fourth Estate and thereby affects its biases. One of the biggest players in this game is General Electric. Not finding it sufficient to be a big sponsor for many TV programs and advertising in newspapers, GE bought RCA in large part to gain control of NBC, and with it control of its satellite operations like MSNBC, CNBC, and assorted other outlets. Gee, is it any surprise that one of the biggest gainers from the election of Obama and the Dems has been GE. I've warned of the rise of Minitrue before. How much further down the road are we to when the sponsors don't even have to pay to influence those in government? They can force your tax dollars to do it for them. Sinister wing = all those who promote, foster or tolerate new Marxist/socialist run governments despite that ideology's historic murder of 100 million people. This morning I received an email from the Media Research Center. MRC clearly have not gotten with the program of forcing the media to apologize for its huge shift L E F T.
One way to force the predominant media to answer for their bias is to persistently connect that bias to horrific results. The first few sentences of MRC's email, slightly edited (shown in bold red), provides an example. While the sinister media focus on defending President Obama’s awkward bow to the emperor of Japan during his Asian sightseeing trip, millions of American seniors and working class citizens anxiously search for the truth about the government’s attempt to take over their health care. But relying on an increasingly irrelevant sinister news media only leaves us frustrated by the steady dose of misinformation and spin. In a badly dis- and misinformed society, where many who help spread the false information are well-meaning themselves, persistence in exposing the sinister roots of those in charge matters a great deal. I've been considering replacing TBD with Sneering for some time as there has been quite a bit of sneering on the part of Obama administration, especially as the healthcare bills have been dragged through Congress, despite constituents and many legislators kicking and screaming. But it took a journalist's question and Nancy Pelosi's blunt response to reveal the current face of the "Progressives." Stay tuned. Don't dare look in Nancy Pelosi's attic as you're apt to find hidden there a horrifying portrait that has yet to be completed. The posers don't like this video much it seems. it and audio version keep getting deleted. Had to find another one. Someone does not like it that Madame Pelosi was shown on the video clip above actually displaying her contempt for us. Her infamous response "Are you serious? Are you serious?" to the question "Where specifically does the Constitution grant Congress the authority for enacting an individual health insurance mandate?" has been removed. Fortunately there are still audio recordings, but still -- the evil doer forcing the removal of proof of the evil doing is just one more flagrant demonstration of the Progress-of. I posted this as a comment to Victor Davis Hanson's Thoughts from the Later Republic. I wrote it because so many other commentators were comparing Obama to Caesar, Pompey, Marius, etc. The significant similarity between Rome and US lay in our cultural decline and ossification of our institutions. The significant disparity between Rome and US lay in that its leaders were also generals that had armies loyal to themselves, whilst our leaders are hardly close to the stature of any of theirs. Our army, while ostensibly loyal to the constitution that is fundamental to our republic and not to any man, which sadly has declined along with our other institutions due to political inroads like affirmative action, PC, and long-standard CYA, could unseat any of our string of Marian-like socialists (Bush being the lite precursor to the heavy-handed Obama). But there really is no mechanism for them to do so without due process, and that is not likely coming from a gaggle of like-minded weak legislators and justices. And Marius was deposed by Sulla, his long-standing fellow patrician-general but mortal enemy. Where oh where do we have anyone akin to Sulla politically let alone militarily? No. No. NO! This is not the late Roman Republic. We will not get a temporary respite from a Marius/Obama socialist because we lack for a potential dictator/general like Sulla. Now, you may say, but what if we could elevate a stately man into the more benign Cincinnatus dictator style of the early republic? Sorry, Cincinnatus reigned as temporary dictator (twice) to repel external invaders, while Sulla had to overcome perfidy from the inside, which is more our situation. A scenario better fitting of a Cincinnatus would require that Islamo-fascist terrorism is anywhere akin to Parthia (who obliterated Crassus and his army) by the simple-minded proxy that contemporary Iran's locale is ancient Parthia, and the denial that traitors within our republic do not exist. In my humble opinion — and very humble it is because I don’t see anyone here even giving me the time of day to respond in kind, let alone Dr. Hanson — the only thing that can save this republic short of a major upheaval is a major restoration of our great cultural heritage by majority agreement. Good luck with that project short of massive prayers that are miraculously answered. IOW, short of divine intervention, we (~230 years) are on track for the appearance of our Imperator at a far faster rate than it took Rome (~500 years) to get there. For the last few days I've taken to calling the radical left wing of our politics by the label – S I N I S T E R W I N G – which they well deserve. It is guaranteed to be a label that namby-pamby "conservatives" will avoid out of fear of seeming gauche for stating the unpleasant reality. With the deadly things that have happened under Marxism for the last hundred years, how can radicals – who still want to create a global government based on that proven deadliness – be thought of as not merely left but also sinister? It will be safer for all of us targeted-subjects to speak no longer of the Radical Left wing, but of the Sinister wing. Please keep that in mind when you read the following comment I left at Eternity Road to an important Mark Alger thread a short while ago. The danger from radical islam comes not from the shootings on home soil but from the insidious advance of this ideology by social means, by undermining the will to resist, by using our own institutions and insistence on freedom of religion and free speech to destroy our way of life. The Radical Left has taken over the Democratic Party. They have been exceedingly and uncharacteristically accommodating to the most restrictive religion on the planet. That party now holds the reins of power in the Executive and Legislative branches of our government, and is still but a shaky (Kennedy) vote away from control of SCOTUS. And the Justice Department is setting the stage to allow the planners of the 911 terrorist attacks to defend themselves with all the tricks I described in Victimoguery. That is an awful lot of power in the hands of S I N I S T E R forces. I was in the midst of writing what I consider an important essay titled "Reassessing Fundamentals" when news of the Fort Hood murders came to my attention. Not only did I not finish it on 5 Nov, but I also had two other efforts I had started on 3 Nov and 1 Nov respectively with the revealing working titles "I'm sorry that I'm not completing my screeds," and "A Sign of Frustration." I wasn't in a funk due to what was about to happen. No, I don't believe I was so clairvoyant this time. I was having difficulty because I feel that Orwell's warning, "the purpose of Newspeak is to destroy man's reasoning ability," required a more active counter-offensive. Before I could move on I wanted to reassess fundamentals of our language so that I could help lift the clouds on our minds. Funny thing now that I consider it. Political Correctness is a form of Newspeak, with its inherent double-think of "better not say that." PC has long been in our schools and in our media (even much of "conservative" talk radio) and in most of all in our politicians. And now it is clearly at the very top of our military. It is what made the massacres at Fort Hood all that more inevitable -- and thus even more outrageous. So I stopped writing what I was working on and moved around the web to add to the comments at various sites. I think I helped form thoughts at those places, and that's really what a writer hopes to achieve, gaining scarce credit or even no credit. From the first my comments attacked the reports that had one voice after another calling the event a tragedy. I called it an outrage for a number of reasons, especially the gall of an army officer and presumed gentleman to act as if he were a cloaked spy; worse: an infiltrator bent on murdering enlisted men who were trained to respect and trust his rank. His act was so rank. But in retrospect, as the role of the PC climate came to light, along with its diversity and multicultural aims, Political Correctness has finally begun to appear to be the worst element present. PC was the murdering Hasan's silent partner. Political Correctness was the institutional disease that was Hasan's great enabler. That is the conclusion I hope all in America, the very many who still love her, will arrive at on their own. I give up trying to convince anyone who is viscerally unable to arrive at this same conclusion by using their own God-gifted commonsense . If commonsense and a core personal survival instinct cannot convince my fellow Americans, what chance do I have? Here's how you will know when America is on the road to recovery from this disease. It could be very soon if Americans simply demand this first thing. Even before Hasan is found guilty and executed, Political Correctness in our armed forces -- and all its concomitant poison -- must be executed long before he is. 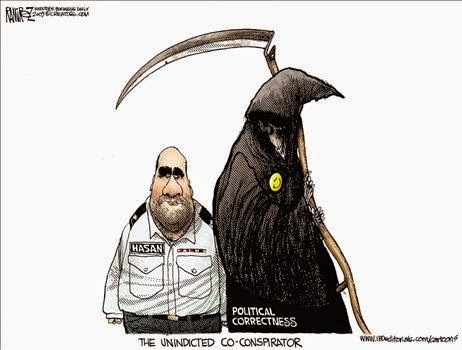 Michael Ramirez on Hasan's un-indicted co-conspirator downloaded from Townhall's archive.